The effectiveness of bisphosphonates (BP) in reducing risk of second breast cancer and recurrence in observational studies has been minimally studied. 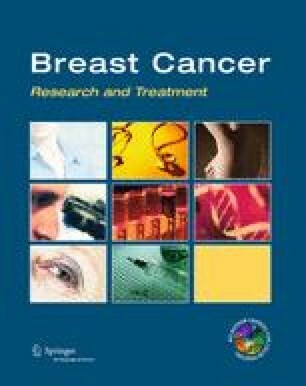 We examined the association of oral BP use on risk of contralateral breast cancer (CBC) and recurrence in 16,781 women diagnosed with early-stage breast cancer from 1996 to 2007, treated with tamoxifen, and followed through December 31, 2009 at Kaiser Permanente Northern California (KPNC, n = 8857) and Southern California (KPSC, n = 7924). Sociodemographic, clinical, and pharmacy information were extracted from electronic medical records and cancer registries. CBC was identified from cancer registries, and recurrences from electronic health records and chart reviews. Multivariate Cox regression models were used to estimate hazard ratios (HR) and 95 % confidence intervals (CI) treating BP use and hormonal therapy as time-varying variables. After mean 6.4 years of follow-up, 494 (3.0 %) women developed CBC. BP use post-breast cancer diagnosis (>93 % alendronate) ranged from 14.5 to 24.9 % at both study sites. Overall, there was no association of BP use with reduced risk of CBC (ever use, HR = 0.96; 95 % CI 0.67–1.38 and continuous use, HR = 1.03; 95 % CI 0.88, 1.20). Similar null associations were observed for recurrence (ever use, HR = 0.98; 95 % CI 0.82, 1.17 and continuous use, HR = 1.00; 95 % CI 0.92, 1.09). Associations varied somewhat by site yet confidence intervals overlapped. BP use was not associated with reduced risk of recurrence or new primary disease among women diagnosed with early breast cancer and treated with tamoxifen. This work was supported by the National Cancer Institute (R01 CA136743 to R.H.). We thank Erin Weltzien and Cecile Laurent for additional programming support. The contents of this article are solely the responsibility of the authors and do not represent the official views of the funding agencies. NIH, NCI R01 CA136743 (“Antidepressants and Breast Cancer Pharmacoepidemiology”).